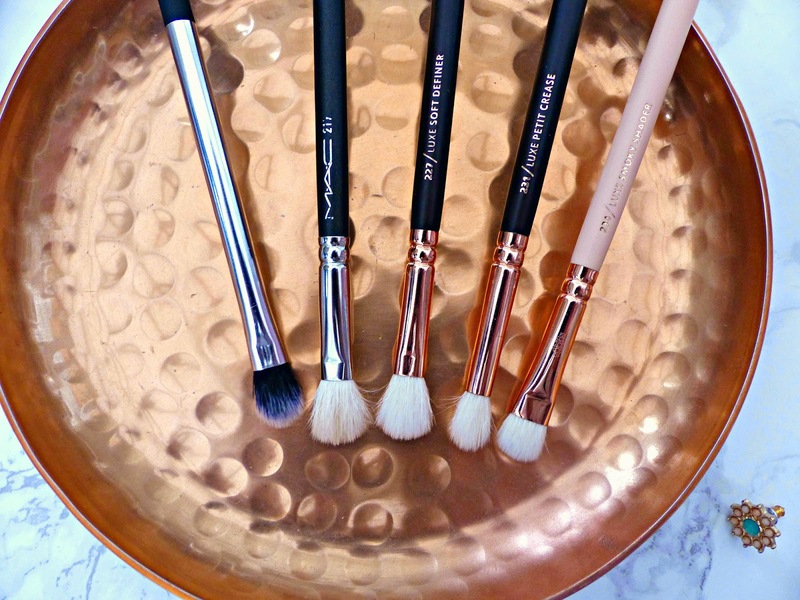 Great eye brushes are hard to come by and out of all those I've tried and all those I've liked I've whittled it down to 5 absolute essentials that I could easily do my eye makeup with alone. If you're starting out with makeup these are the ones I think you need. If my house caught fire and I had time to grab some eyeshadow brushes (haha!) these are the ones I'd be dragging from the ruins. I got mine as part of the Nic's Picks Set however you can get it in the current Starter Set, though unfortunately not individually! However I use this every day so if I had to re-purchase it I would buy it in a set. This is the ultimate 'do everything' brush. The synthetic bristles mean it can be used with cream or mousse formulas as well as the usual powders. The fluffiness means it's perfect for applying the base shade across your entire lid but also it's amazing at blending out any harsh edges. The tapered tip means you can even use this to do your crease shade. I hate to be a cliche but what essential eyeshadow brush post would be complete without the much-loved MAC 217? I have no idea how I was blending my eyeshadow before I got this brush but it really makes it effortless. I also like this a lot for applying the lid colour. It also works really well to apply your crease shade. It's a really great all-rounder, which I think is why it's proven so popular. I got this in the Rose Golden Luxury Set however you can get this alone for a mere £6.50! It's certainly a more purse-friendly alternative to the 217. Whilst it's slightly smaller, it's also a mostly natural-bristled brush and very similar in shape. I use it for more or less the same functions as the MAC 217 however with that kind of brush it's always good to have a couple so you can use one for the lid colour and the other to blend. Another from the Rose Golden Luxury Set that you can also buy on its own is my favourite ever crease brush. The Luxe Petit Crease brush is a small brush tapered to a point that just fits perfectly in the eye socket. The bristles allow you to blend out your crease shade with minimal effort and I reach for this every single day. You can tell I really got my money's worth with Zoeva's Rose Gold sets! This one is from the Rose Golden Volume 2 Luxury Set, again available on its own. Again it has natural-synthetic mix bristles and this one is pretty much what it says on the tin; it works perfectly for applying the darker shade to the outer part of you eyelid and blending it in to get a perfect smoky eye. You can also use it to take the shade under your eye and smudge it out. I'm no pro when it comes to makeup application but these brushes have seriously made applying eye makeup a breeze, even for me! 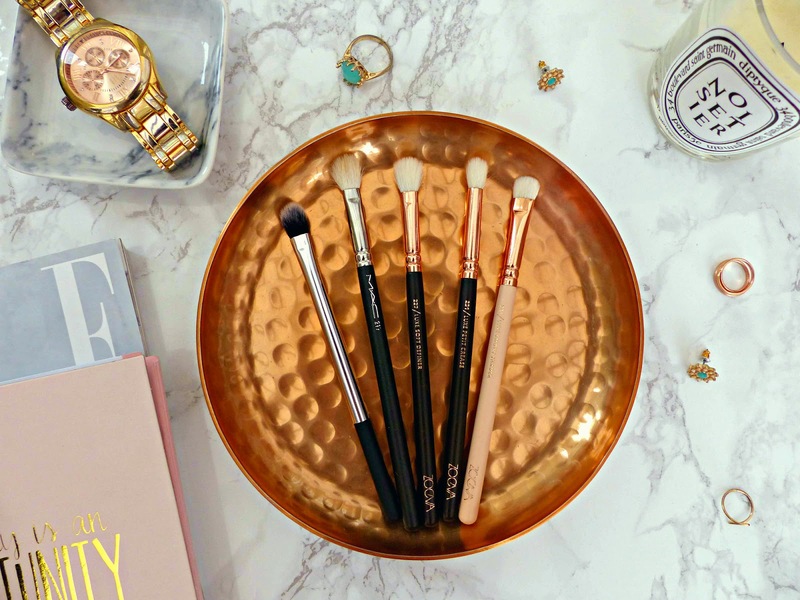 My absolute favourite brand for eye brushes is the really affordable Zoeva, which you can get from their site or Beauty Bay and this is a great start if you're quite new to investing in proper brushes. Which eye brushes can't you live without? I just love the MAC 219 :D Your photography is beautiful! I really need to get some good eyeshadow brushes - I don't have any I would even recommend at the moment (I'm more of an eyeliner girl who wants to spread into eyeshadow)! Love your pictures, I really want to try Zoeva brushes though, they look gorgeous, the rose gold makes them exceptionally pretty. I need to get some Zoeva brushes! They look so amazing! I have one from Crown brush that I use daily. :) The Zoeva ones look soooooo good- I need to try them! I love the RT Base Shadow Brush - I use it every day too. I keep umming and ahhing over whether to buy the MAC 217 and I really should just do it already because it's clearly worth the investment! My picks would basically be exactly the same apart from the real techniques brush ( just because I haven't tried it before). You are right about the MAC 217 there is a reason it's hyped and it's a stable that I use everyday. 100% worth the investment. I really need to get my eyeshadow brush game on. I have some Eco Tools one but they're a bit old and past it now. ZOEVA definitely sounds like a good all rounder! I definitely need that Zoeeva 234 in my life though!! I definitely need to get that RT set to get this brush, sadly it's the only animal friendly one... Great review though! I need to get the Zoeva brushes, they look and sound so lovely! I love the 217 by MAC. It's such a classic! The picture look lovely by the way. I've only recently gotten into wearing eyeshadow and whenever I do I use my fingers (gross I know). That's only because I have no clue which brushes to use and not to use! Hell yes for those Zoeva Brushes! They are always my first to reach for brushes! I adore them!